Whether through a small gesture to brighten a classmate’s day or a donation to pay for a mother’s cancer treatment, Campbell Union High School District students have been finding different ways to help fellow students, parents and teachers. 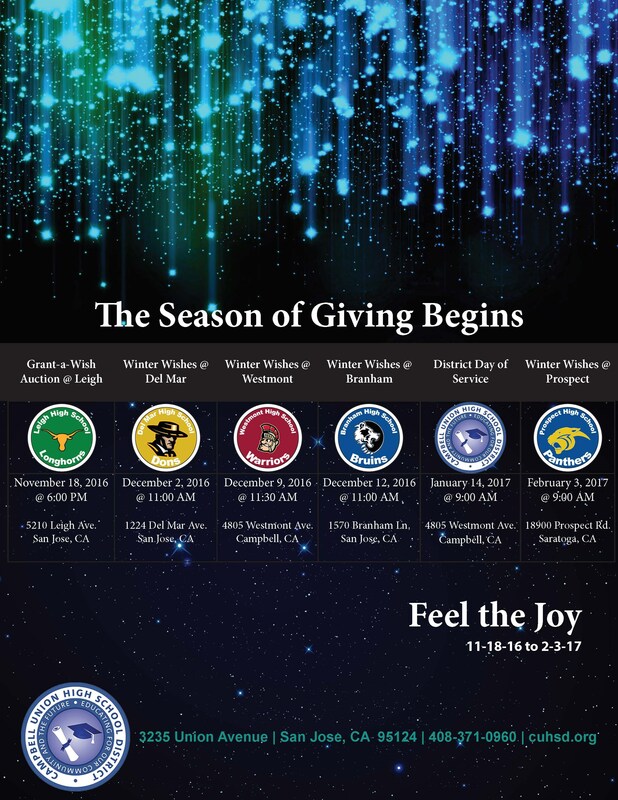 It’s all part of Season of Giving, a series of charitable events organized every year by students for the winter season. The oldest event, Branham High School’s Winter Wishes, marks its sixth year and has also become a tradition at Del Mar and Westmont high schools. Every October, 1,700 Branham students and faculty write their winter wishes on paper star cutouts. Through donation requests and fundraising bake sales, the students who run Winter Wishes pay for everything from the small wishes granted in November and early December to the larger wishes presented at Branham’s winter holiday rally to cap off the festivities. Teenagers often just want simple pleasures, according to Fiorella Castaneda, a Branham High senior and community service representative in her leadership class. But many students want “just financial help in any way,” maybe to pay for their Advanced Placement test fees, new laptops or backpacks filled with school supplies. Some families also benefit; last year a girl’s mother who suffered a stroke was given a recliner chair so she could be more comfortable while recovering at home. Another time, three students raised $1,500 to help their friend’s mother pay for cancer treatment. Both families received gift cards for dinner and movie tickets as well. “I’ll never forget my freshman year,” Castaneda said. “One student wished for a sweatshirt” and his classmates bought him a whole new wardrobe instead. “It was very sentimental because all he wished for was a sweatshirt and the school gave him so much more,” Castaneda said. Each district school holds its own special event to honor recipients of larger wishes and celebrate the spirit of giving. Leigh High School held its Grant-a-Wish Auction on Nov. 18, where students bid on such things as extra credit assignments and used the money to grant the wishes of their teachers and fellow classmates. Last week Del Mar High School held its Winter Wishes rally, and Westmont and Branham each will have their own on Dec. 9. Branham’s rally will be held in the quad outside this year because it outgrew the school’s multipurpose room. The last Winter Wish event takes place Feb. 3 at Prospect High School, officially marking the end of the Season of Giving. But the public can still give year-round. Branham’s leadership class has a GoFundMe page where all donations received after Dec. 9 will roll over into the Winter Wishes fund for next year.